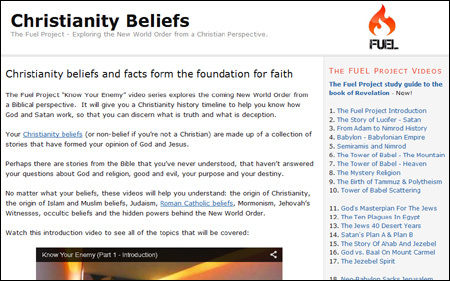 Christian Beliefs features several different sections which cover Bible prophecy. The 70th Week of Daniel Bible Study Series explains the fulfillment of the 70th week of Daniel, which most people assign to the end times as a 7-year tribulation period. The truth is that the 70th week of Daniel was fulfilled on time, after the 69th week, from 27-34 A.D.; when Messiah and His disciples confirmed with the Jews for seven years, that He was the promised Messiah who atoned for their sins as the Passover Lamb. After the seven years the Gospel was also preached to the Gentile nations. Don’t be misled any longer, get the truth with this Bible study series about the fulfillment of the 70th Week of Daniel. It’s the most important week in all of human history, for in it Messiah died for our sins. Learn the truth in this study series. – New! The Revelation Timeline Decoded explains the beasts of Daniel, the beasts of Revelation, the Two Witnesses, the Seals, Trumpets and the bowls, where we are at on the fulfillment time, and what will next. – New! The Olivet Discourse Deception explains how all that Messiah described in Matthew 24, Mark 13 and Luke 21, was fulfilled in the first century; as the temple, city and Jews were desolated; because the Jewish leaders rejected Messiah and delivered Him up to be killed. – New! 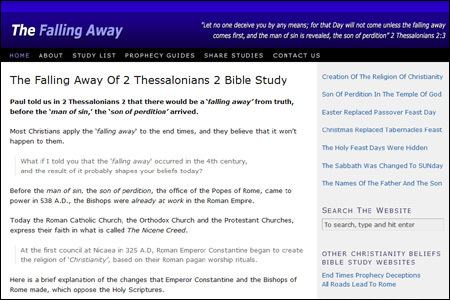 The Falling Away of 2 Thessalonians 2 happened when the Bishops of Rome and Emperor Constantine created the religion of ‘Christianity’ in the 4th century. 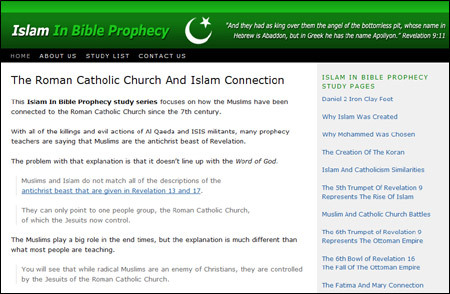 Islam in Bible Prophecy explains the historical relationship between the Roman Catholic Church, Islam and Muslims. End Times Deceptions features Bible studies that reveal the truth about who is the antichrist beast of Revelation, the Little Horn of Daniel, and the Son of Perdition of 2 Thessalonians 2. Roman Catholic Beliefs explains how what the Popes teach is contrary to the Word of God. The Fuel Project “Know Your Enemy” video series explores the coming New World Order from a Biblical perspective. 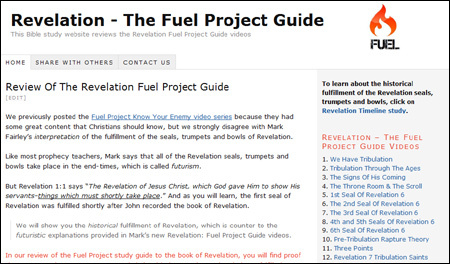 The Review Of The Revelation Fuel Project Guide exposes the many deceptions that were taught in this video series, and provides the true explanation. For all who desire to understand the final days, bestselling author and speaker Steve Wohlberg presents this 5-part video series, which is excellent for personal and small group study. You will discover the New Testament distinction between “Israel after the flesh” (1 Corinthians 10:18) and the “Israel of God” (Galatians 6:14-16) centered in Jesus Christ. You will also gain vital insights into what the book of Revelation really says about Mount Zion, the New Jerusalem, the Heavenly Temple, Babylon the Great and Armageddon. Steve Wohlberg teaches about the Rapture, Tribulation, Antichrist, Israel, in this end time Bible study. Will Christians vanish in a rapture? Will 7 years of apocalyptic terror overtake those left behind? Will one Diabolical antichrist rise to control the world? Will he enter a rebuilt Jewish temple, claiming to be God? Will Earth’s nations attack Israel at Armageddon? Best-selling books like Left Behind and popular apocalyptic movies predict such things. Are they correct? No area of Christianity has been subject to more misguided interpretation than prophecy. Millions of Christians sense we are nearing Jesus Christ’s return. Yet when it comes to what the majority thinks will happen during Earth’s last days, and what the Bible actually says will occur, the difference is seismic. With clarity and biblical accuracy, End Time Delusions from Steve Wohlberg exposes massive errors now flooding through media and in much of today’s sensational prophecy writing. These videos closely examine tightly meshed yet speculative theories about the rapture, seven-year tribulation, antichrist, and the modern Jewish state. Buttressed with solid teachings from many of Christianity’s most illustrious scholars, it lets the Bible speak for itself about the past, present, and future. my complements for your articles. With respect to Greek critical texts, many scholars say the Vulgate came from Sinaiticus and Vaticanus, which is backwards. After 10 years of study, I have the forensic proof that the Sinaiticus and Vaticanus (Hort and Westcott and modern translations sources), are actually derived from the Latin (with hundreds of Catholic doctrinal changes) plus dozens of arian and gnostic doctrinal changes. Yes, these two Greek texts were back-translated, at least in part, from the Latin of the Roman church of the 4th and 5th century. Malachi 4:2 troubles me. I can’t find any good explanation for “Sun of righteousness” capital S and sun not son. The last book and the last chapter of the OT. But unto you that fear my name shall the (b)Sun of righteousness arise with healing in his wings; and ye shall go cforth, and grow up as calves of the stall. You that fear my name; so are they described to us who were written in the book of remembrance, Mal 3:16; who loved the law of their God, and kept it; who believed his promises, and rejoiced in expectation of the good promised; who believed his threats and trembled at them, that they might rest in the day of trouble, as Hab 3:16; who walked humbly with their God. The Sun; Christ, who is the day.spring from on high, Lu 1:78: or, as most elegantly described Isa 60:1-3, who is very fitly compared to the sun; Fountain of light and vital heat to his church, he enlightens and enlivens every one Joh 1:4,9. If I may interject here. My understanding of Hebrew to English is that the order of their language and ours differs much, as well as no words are capitalized in the original texts. Therefore Carol, the idea of a capitalized word in our texts is erroneous in and of itself. Also, we must as students of God’s words, remember context, Context, CONTEXT. The numbering system is NOT in original texts and many people fall into misunderstanding by being misled by thinking that each numbered verse is a truth by itself. In Malachi 4:1 he warns us of God’s judgment on the wicked and continuing in 4:2 he tells us of the blessings of the good. He tells us we shall have the sun shine on us and later says and we will frolic as well fed calves. Just my two cents worth and valued perhaps much less. To God be the glory! The 70 weeks of Daniel come from the 2300 days so if the 70 weeks are converted to years you have to convert the whole 2300 days to years. You can’t just change part of it. Steve, the association of the 2300 days to the 70 weeks is not correct. That is taught by SDA Pastors, but it is based on a wrong assumption that both prophecies started at the same time. Since proclaiming that the 2,300 days was 2,300 years, resulting in people proclaiming that Messiah would return in 1844 A.D., one would think that they would question their interpretation of the prophecy when that did not happen. But instead of doing that, they proclaimed that Messiah started His Investigative Judgment, which is not Scriptural. That means that as of today He would have been in Investigative Judgment now for 172 years. I pray that SDA Pastors wake up to the truth about the fulfillment of the 2,300 days. I’m blessed to know that the studies have helped you Waseem. I don’t make profits on this website, so I’m not looking to pay someone to translate it. If that is your calling, you have my permission to translate the information. Hi, have you noticed Genesis 4 : 24 and Matthew 18 : 21-22..I understand that the latter two verses relate to the 490 years as mentioned in Daniel 9…Any thoughts if the Genesis verse is in somehow related to it ? Dave, I don’t think that Genesis 4:24 and Matthew 18:21-22 are related in their fulfillment, but simply that the concept of forgiving someone ‘seventy times seven’ times is from the Father. Matthew 18:21-22 reemphasizes that the Jews were given 490 years (as outlined in Daniel 9) to accept their Messiah and find forgiveness. Hi Gordon. Yeah, I got to know Ed Moore and Paul Sides on Facebook because they were teaching the Hebrew names, the Holy Feast Days, etc. The Spirit is guiding many people back to the ancient paths of truth about those things, and people are looking for teachers about those topics. Unfortunately Ed and Paul are teaching some heretical things about Messiah being 100% human and sinful; and their prophecy explanations about Jesus Christ being the antichrist are wrong, and serve to deflect blame away from the Popes and Jesuits of Rome. I need to say this, but Yahusha is 100% human. I have done a complete study on this very subject. My laptop got full and I put my notes on a USB, I need to find it and send it to you. Paul Sides is not wrong on it. Certain things we are taught are so deeply ingrained into our souls. As far as Yahusha being sinful, I saw the verse he used this week. Scripture does make reference. IMO, I disagree with him on that issue. There is no incarnation, that’s pagan for sure. Just like the Trinity, which started with Nimrod, Semiramis and Tammuz. (Mat 17:2) and He was transformed before them, and His face shone like the sun, and His garments became as white as the light. (Mat 17:3) And see, Mosheh and Eliyahu appeared to them, talking with Him. (Mat 17:4) And Kepha answering, said to Yahusha, “Master, it is good for us to be here. If You wish, let us make here three booths: one for You, one for Mosheh, and one for Eliyahu.”a Footnote: a See footnote Mar_9:4. (Mat 17:6) And when the taught ones heard, they fell on their faces and were much afraid. (Mat 17:8) And having lifted up their eyes, they saw no one but Yahusha only. Mat 3:13 Then יהושע came from Galil to Yoḥanan at the Yardĕn to be immersed by him. Mat 3:15 But יהושע answering, said to him, “Permit it now, for thus it is fitting for us to fill all righteousness.” Then he permitted Him. ELOHEIM created. No WE or US. Just Yahuah. (The above is a copy/paste of my notations). Yahusha was predestined, just like John the Baptist. Also all authority was and has been given to the Messiah. We are given the same as well. I hope this helps, I realize its a lot to take in. Either we accept it, reject or ponder it. Lisa, Rav Shaul rightly protests against people who believe in the trinity, who proclaim that Yahusha is Yahuah. The challenge is that he goes to the other extreme and proclaims that Yahusha was 100% human and sinful. Scripture proclaims that Yahusha is not Yahuah, but he is deity. Scripture proves that Yahusha is subservient to Yahuah, that Yahusha is deity who existed before creation, and that Yahusha was sinless. He is teaching that the Passover Lamb had blemishes. He is teaching concepts that are contrary to Scripture, thereby misleading people who have come out of Christianity. The Ruach is trying to show you the truth about Rav Shaul’s teachings. I pray that you read the studies to see what Scripture is proclaiming. The enemy has deceived most Christians about these things. And now he is working hard to deceive people who have come out of Christianity, by using people like Rav Shaul to teach them wrong concepts. I pray that the Ruach guides your studies and thoughts. 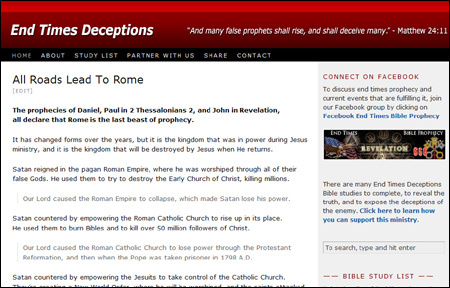 In the October issue of the Maranatha Devotional Guide, reference is made to the christianitybeliefs.org website for an article “The Abomination of Desolation Deception”. I am not finding it on that website. Could you help me find it? Thank you for your website. I look forward to hearing from you. Thank you so much for the truth and insight reflected in this website! I have learned so much. Recently I have read many compelling articles suggesting that the teachings of Paul directly contradicts the teachings of Yahusha and other apostles in many ways. Some suggest that Paul was a “wolf” in sheep’s clothing that tried to infiltrate the church early on. Could you please offer further insight on this subject matter? Hello Ann 🙂 I believe that when people misconstrue what Messiah taught and what Paul taught, then it can seem that they are contradictory. Paul wrote to Jews in some cases, so he positions his teachings to help them see the truth. Paul wrote to Gentile believers in some cases, so he positions his teachings to help them see the truth. He adjusted his message to his audience, to meet them at their level of understanding. But I have not found that what he teaches in contrary to what Messiah taught. Although I have studied for years, I was only introduced to you through a friend yesterday. I finished, agreed with, and enjoyed the Revelation Timeline Decoded video. What are your other doctrinal beliefs, statement of faith? Are you a member of a local congregation where you live? I know you went to the school of hard knocks and I believe, as the Word says, the Holy Spirit is our greatest teacher. But, what is your testimony, how did you come to salvation in Christ, and what is your belief on how someone is saved? Sorry if this is addressed already on your site, but, why Yehusha…I have heard Yeshua? Thank you for your time and commitment to God’s Word! I posted this question earlier, but it seems to have been removed. Can you clarify what your position is on calvinism? Do you believe in pre-destination? My position is that whether we are predestined or not, my job description is the same, as we are called to be a witness to the world. My position is that the Father’s ways are higher than our ways. John Calvin may have been right on some things but he was wrong on predestination. Jesus was sent by the Father to save all of us and Calvin missed that. Therefore, Calvin may have been a teacher of sorts but he was not a prophet. We need to remember that. A prophet of God does not make a mistake. If we are here to be witnesses we must remember the best witness is one who shows others the Love of God. I have started reading through your teaching material and I have really enjoyed it thus far and I am really glad I found your site. I am seeking truth. But I have lots of questions. First some of the things I am reading about the ISR98 are concerning and I would like to get your honest unbiased opinion. Some content that I am reading is saying that the ISR is corrupt translation full of doctrinal biases in the HR movement (just learning about that) and they have taken liberties with the text to push their agenda. I went and downloaded that translation onto my phone after reading your materials but now I have concerns when I see how they have changed certain words like for example renewed covenant instead of new covenant. 2. I loved your names study. I have been feeling very convicted of late about using the generic term God when addressing either the Heavenly Father or Messiah. However, I just found a name study that is very technical and it seems to contradict your name study. This person asserts that those who claim the name Jesus is a derivative of zeus has no historical proof whatsoever to back up this claim. Who is right? Also the Hebrew he shows seems to differ than what you show?? Who is right? I would be happy to share with you the URL so you can read and provide me with your honest opinion of his or her work. Lastly, although I am curious about a lot more, I wanted to get your response regarding the observance of the Sabbath. If you are saying there is no basis for a Saturday Sabbath then what day are you observing? Also I have a good friend who is a very devout follower of Judaism and he observes Sabbath from sun down Friday to sun down Saturday. Anyway I am looking forward to hearing back from you and learning more. Thank you for your comment Ben, I’ll try to answer your questions briefly, and then refer you to my studies for more info. Bible scholars will always debate about what version is best, especially King James only people. Given that most modern Bible versions chose to replace the Father’s personal name with God and Lord, they really have no leg to stand on. I don’t believe that the ISR is connected to the Hebrew Roots Movement per se, or that they have an agenda. A Christian who is following the teachings of Rome would say that, since they observe pagan Easter and Christmas, instead of Elohim’s seven Holy Feast Days; since they used Greek Jesus instead of Yahusha. From my reading the ISR, I see where it got the translation right, where the King James Bible failed. It should say ‘renewed covenant’ as the covenant that Messiah came to ratify with His blood as the Passover Lamb, is the everlasting covenant that was made to Abraham. So it is in fact an old covenant, that was made new, when Messiah ratified it with His blood. So the ISR got that right. As for the HR movement, some people are very legalistic; but the fact is that the Tanakh, the Old Testament, is a Hebrew book. The Spirit is moving to return people to the ancient path of truth, and that involves understanding the Feast Days, the Hebrew names, etc. That’s a truth movement! As for the names, people will debate endlessly about that too. I’ve read many studies, and feel comfortable with Yahuah and Yahusha. I follow the lunisolar sabbath calendar, which bases the Sabbath on the lunar cycle. Interestingly, today is the full moon, and it’s the second sabbath. That is the beauty of the lunisolar Sabbath calendar. The High Feast Days of Unleavened Bread and Tabernacles are highlighted by a full moon. It includes some explanations videos that prove that a day starts in the morning, not at sundown. That is a Jewish fable. The only day that we are to start an observance the night before is the Feast of Atonement, which declares to start in the evening of the 9th day, not the 10th day. So even it is not saying that a day starts in the evening. And Messiah’s crucifixion and burial proves the point that a full daily cycle ends in the morning. Thank you for your reply David. I really appreciate it. I know you will look at this before it gets posted so I was wondering if we could possibly exchange emails, because I would like to have an ongoing dialogue with you if that is possible. You can redact this part out if you would like when/if you post this “comment”. I am really so happy I found your website. I started on a journey two years ago (unbeknownst to me at the time) when I attended a prophecy seminar put on by the SDA evangelistic arm. At the time I never heard Daniel or Revelation taught the way they did or anything regarding the roman catholic church & pope being the beast/antichrist. It shocked me really. Even more I never really thought about the Sabbath before that point in time either. We have since become very good friends with the leadership of this SDA church that hosted the evangelistic outreach and really good friends with the evangelist that travels around putting these meetings on. I love these people dearly and we do attend the SDA church fairly often to fellowship with them, but I refuse to join their church for a number of reasons. 1. I just don’t believe in denominations. 2. I just can’t swear to ellen white as a prophetess or her teachings that they require you to do in order to join the church. It seems blasphemous to me. Anyway, I never learned any of this stuff when I went to Seminary 20 years ago. Not only that I never learned at Seminary how to really study the Bible either. So now I am on this journey to really seek to understand prophecy and the Truth of Scripture, sound the alarm of the truth of the Messiah’s soon return, learn how to more effectively study the Scriptures and then teach people how to really study it themselves. I have a couple of questions regarding the name Yahuah. Please forgive my ignorance and at this point I don’t have a great working knowledge of Hebrew. It’s been 20 years since I had Hebrew in Seminary and I haven’t used in 18 or more years so it’s like I don’t even really know it anymore. So my question is regarding the tetragrammaton Yod Hei Vav Hei. I’ve ready your name study a couple of times and where I am not understanding is relating to the consonant Vav. Why is Vav being showed as Waw? Certainly that makes a big difference in the name from Yehovah or Yahuah. I have a few questions regarding the name of the Messiah. 1. If we speak in English why do you think it is so important/why does it make sense to use a/the Hebrew name in place of the english transliteration Jesus? 2. If the language of the New Testament is Greek where is the Hebrew name for Iesous (ee-ay-sooce) coming from? The Hebrew translation of the New Testament Greek? 3. If comes from a translation of the greek into Hebrew does that create a similar problem of translating or transliterating the name Iesous (ee-ay-sooce) into English? I am anxious to hear back from you and thank you for your patience and I apologize in advance if I am asking a question you have already answered somewhere else. Brother David, greetings in the Name of our Lord. My name is Robert Caringola. I authored “Seventy Weeks the Historical Alternative” & “The Present Reign of Jesus Christ.” I just got off the phone with a brother named Don Carra. He informed me about your web site. Blessing for your endeavor and courage. Keep going, you’re on the right track! Thank you Brother Robert for your message! I have read both “Seventy Weeks the Historical Alternative” & “The Present Reign of Jesus Christ”, and learned so much from them. We are kindred spirits, as I love your concise explanations! Yes, we must redeem these times while it is still light, for darkness looms on the horizon! Would like to contact you if possible. This site did not accept my initial greeting. With so many websites, I have found myself overwhelmed. Do you recommend reading through these studies in any particular order? Here’s a link to a Bible Prophecy Made Easy study, which helps you see the big picture about the fulfillment of the prophecies in Daniel, 2 Thessalonians 2 and Revelation. You can use the green Print/PDF button on the bottom of the page, to save it, and I recommend printing it out, as there’s a lot to take in. Hello Johannis 🙂 I’m blessed to know that the studies have helped you see the truth about prophecy fulfillment, as the internet is filled with a lot of false explanations. I don’t know it all, but I’ve learned a lot from reading the writings of the great theologians, who lived in the 16th-20th centuries, before the futuristic deceptions crept into the church. Thnx so much for your swift response. I was thinking: is it convenient to post every question with commentary here? Or is it maybe better to send them to your email address and that you can then respond and decide for your own which you like to publish on your website? My advanced gratefulness for your effort. Johannis, as you read through the studies, feel free to comment on the page that you have a question about. Then others can read your question and my reply. I discovered your websites about seven months ago and continued looking through everything on them. This is where I believe Yahuah revealed Himself to me. He has continued to reveal the truth over time to me as well. At first, I had a hard time accepting all of this since I was still a Christian going to church and practicing many pagan customs thinking they were bringing me closer to our heavenly father. After much meditation and not even going to church, I stepped out of Christianity and I believe Yahuah is leading me to the truth continually. One thing that I am unsure of is the black Hebrew Israelite thing going on all across the internet. I am not sure if they are the true Hebrew Israelites or just Canaanites that are still annoyed about American slavery. This sprung up about a month or two after I found Yahuah. These people still believe in Yahuah and Yahusha though. I do believe that the timeline of Revelation is historic and not futurist as you have shown us on revelationtimelinedecoded.com, so that was one red flag I had about all of this. So what are your views on these people and what they believe? Are they trying to do the will of Yahuah and his son Yahusha, or are they doing it only for themselves? Thank you for continuing to do the will of Yahuah. Hello Weston. I’m blessed to know that the studies have helped you find the truth. Sadly, the enemy has deceived the end times church about many things. As for Black people proclaiming that they are the real Hebrews, I don’t believe that the Hebrews were white, but the supposed proofs that they use to say that they were black, are taken out of context. They point to Job saying that his skin is black upon him. Do black people go around saying that they skin is black upon them? No! Job was pointing out that he was so diseased, that his skin looked black; so he was pointing out an abnormal condition,. They cite the passage in Revelation that says that Messiah’s hair is white as wool. They say that describes the hair of black people, but the verse wasn’t pointing to the texture of the hair, but the color. I think that everyone wants to be a part of a special group, and that they are claiming this for themselves. The challenge is that some of them come across as racist, against white people, as if they are superior to them. Contact me anytime with questions and/or insight about the studies. Thank you for clarifying how the black people feel about wanting to be a part of a special group just like some other followers. It is sad to see how much the church has been deceived ever since Yahusha came to this earth. I have also wondered about the removed books of Scripture such as the Book of Enoch, Jasher, Jubillees, Apocrypha, etc. Are these books reliable? Was there a reason that Yahuah allowed them to be removed? Are there things in them that could bring us closer to Him? Thank you for your swift reply, and may Yahuah bless you. Weston, I think that the book of Enoch was written around the 2nd century B.C., by various authors; so it doesn’t seem to have been written by the esteemed Enoch of Scripture. Someone just sent me The Cepher Bible which has Jasher, Jubilees, etc., so I’m reading those books. Apparently they weren’t included in the 66 book Bible because they aren’t written like the other Scriptures, such as the case of Enoch; or they include some statements that are counter to the other books. It’s not going to hurt you to read those books, and then you can see what they are saying. I was reading in 1 Esdras, which is the continued narrative from Ezra, which reads just like Ezra, and has some interesting information about rebuilding the temple and city. I read your page with deep interest as in these times, more than ever before, we must be prepared. I was looking at your Bible study on the KJV versus the NIV, and I have studied many of the latest translations in comparison, although not to the depth you have I am certain. Which leads to my question. What do you say about the Mounce Reverse-Interlinear New Testament, or other such versions using the Hebrew and Greek from the earliest writings we know of to directly interpret the words of God? My comment begins here once again. This seems to indicate that the original texts did not include the words left out of this passage in the NIV, yet included (added by translators?) in the KJV. This is not a reflection on you for we are to stand alongside our brothers in the Christ Jesus, but must we be careful to worship God and not a translation? I have heard some preachers speak about this and I always run into real angry rhetoric from many of them when I refer to the Mounce or any other Interlinear Bible. It seems that they have come to a place of “worship” of of the KJV as opposed to God’s words spoken and recorded in the greek (and Hebrew-OT)) comparisons. I was condemned, and tossed out of a Church one time where I was a musician and singer, for this very reason. God be with you, and thank you for any reply you choose to send. My email address (which I do not use much) is ######, and my phone number (for text or call) is #######. I reside in #####. I am also available on facebook at FRET NOT MINISTRY. My secretary attends this site, but I post, and check on it once a week or so. Thank you for your email Bill. This is one of the first studies that I wrote about five years ago. And I’ve learned more truths since then. I now read The Scriptures (ISR) and the Aramaic-English New Testament, which reveal some interesting truths. An example is Acts 8:37, which is absent from the NIV, but included in the KJV. But it is not included in the Aramaic Peshitta manuscripts. I’ll circle back and go through this study, to see how the Aramaic-English New Testament renders it, to see how it compares to the KJV and the NIV; and then update this study. As for the MOUNCE, I had not heard of it until you mentioned it, so I’ll check it out. The King James in not inerrant, it is flawed. But no translation is perfect. I have recently stumbled upon your site and have been captivated by your lessons. I plan to learn more through your various studies, however, I was wondering about the traditions and feasts that you were saying should be celebrated instead of the Pagan holidays such as Christmas and Easter and wanted to learn more about them such as their dates, practices and procedures, and purpose. I can’t seem to find them immediately, so I was hoping that you could direct me to where I can find them on this site, or if you could offer me the answers right away on this post I would be very appreciative. Also, if you could offer your thoughts on these traditions and their significance in the development of our spirituality and connection with Yahuah, it would be greatly appreciated. Thank you for your hard work. Just wanted to check: did you get our gift of $20 which we sent to you through the “Go Fund Me” link on the Christianity Beliefs homepage? Do let us know. We are really blessed by the ministry which you are doing. Yes I did, thank you! I sent a thank you message via GoFundMe and also from my ChristianityBeliefs email address, but I think that it came back with an error, saying that it didn’t go through to your email. I’m blessed to know that the studies have helped you! I really appreciate your work and I feel blessed to take part of it. That’s why I want to spread the message to my countrymen so that they may get their eyes opened for the grand deception. And some texts from the http://christianitybeliefs.org/end-times-deceptions/. 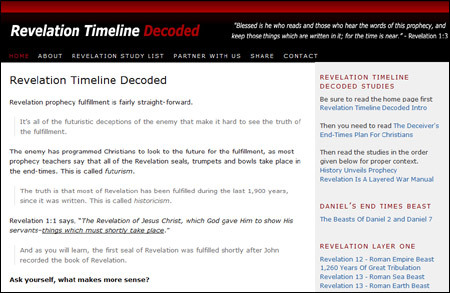 Regarding revelation-timeline-decoded it exist as both a standalone site and as part of the christianitybeliefs.org site. What is the difference between the two? For translation I guess I should go for the standalone site. I noticed that the http://christianitybeliefs.org/contact-david-at-christianity-beliefs/ is missing the box to enter a message. May our Father in Heaven bless you in your continued work. Hello Stefan 🙂 Thank you for the work that you are doing! May our Heavenly Father bless you immensely in your ministry!